With 2018 being called The Year of the Woman (in reference to the 1992 wave of women elected officials) and with the 116th Congress being the most diverse on record, it’s true that our nation’s government has become more diverse. Is this true about the staff that they hire? Currently people of color in Congress consist of less than 15% of staffers in the House of Representatives and less than 10% in the Senate. One of our fellows has developed a tool that could change that. 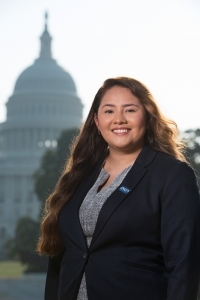 Itzel Hernandez, one of our 2018-2019 Public Policy Fellows, compiled a Best Practices list for staffing Congress through her placement at the National Association of Latino Elected and Appointed Officials (NALEO)! According to Itzel, NALEO and the Joint Center for Political and Economic Studies set up the Staff Up Congress initiative, aimed at elevating current staffers to climb top congressional positions in efforts to create a more representative workforce through development opportunities. Internship Recruitment: Tap into the talent that national organizations and networks dedicated to increasing diversity bring to D.C. – for example, CHCI’s leadership programs! The Hiring Process: Implement diversity-focused practices in the hiring process, such as the Rooney Rule and diversity/inclusion hiring plans. Conduct Performance Evaluations: Provide feedback for staffers of color on the Hill, letting them know what they’re excelling in and how they can improve – and reward their work! Increasing and Retaining Diverse Candidates: Set the expectation that the office is a place to grow and feel welcome – provide professional development and mentorship for staffers of color. The impact that being included in an environment like Congress makes on as a person of color extends far beyond the halls of Capitol Hill, Itzel recalled on LinkedIn. CHCI’s mission is to develop the next generation of Latinx leaders – a mission that connects all of us. From interning on Capitol Hill to building pipelines through fellowships, CHCI is proud to be a part of building a more inclusive future that represents the future of our country. Check out the guide at Best Practices for Fostering a Diverse and Inclusive Workplace in Congress! To learn more about our leadership initiatives, check out: https://chci.org/programs/.